Ray Hardee continues his explanation of process safety management. Complete and accurate information concerning process chemicals, process technology and process equipment is necessary to develop an effective PSM program. This information is used to develop the process hazards analysis, training programs, operating procedures, information for the contractors working on the project, pre-startup reviews, materials for local emergency preparedness planners along with insurance and enforcement officials. A major component of the process safety information is a diagram to help users understand the process. As outlined in 29 CFR1910.119, the diagram can either be a simplified block diagram, process flow diagram, or a piping and instrument diagram (P&ID). The piping schematic is the primary interface of the piping system model. It is provided in the form of a flow diagram or P&ID and offers the user a comprehensive view of the system. The piping schematic shows all the major items in the piping system including pumps, tanks and vessels, heat exchangers, control valves, along with the interconnecting pipelines. The various isolation and check valves are displayed for each pipeline. Every item in the piping system model has a user-defined name, which increases the usefulness of the piping schematic. The addition of text and notes on the drawing increases the presentation value. The piping schematic serves as a front end to the detailed information available in the piping system model. The model contains the information for pipelines, tanks, pumps, control valves, heat exchangers, strainers and filters, along with any other item that may be included in a piping system. The process fluid in each pipeline is defined in the model. The physical properties of the fluids are defined, including temperature, pressure, density, viscosity, vapor pressure and critical pressure. By attaching a hypertext link to the fluid Material Safety Data Sheet (MSDS), everyone has immediate access to the information needed for an accurate assessment of the fire and explosion characteristics, reactivity hazards, safety and health hazards to workers, and the corrosion and erosion effects on the process equipment. Hypertext links can be attached to other documents required by the PSM including the codes and standards used to establish good engineering practice. The process hazard analysis is one of the most important elements of the process safety management program. It is an organized and systematic effort to identify and evaluate the potential hazards associated with the handling highly hazardous chemicals. It analyzes the potential causes and effects of fires, explosions, release of toxic and or flammable chemicals along with major spills of hazardous chemicals. The process hazard analysis is dependent on good judgment along with documentation stating the assumptions made during the study. It is important that the team understand the assumptions and the information, which can be reviewed and maintained for a future process hazard analysis. An accurate simulation provided by the model gives the team a clear view of how the piping system will work under any expected operating conditions. 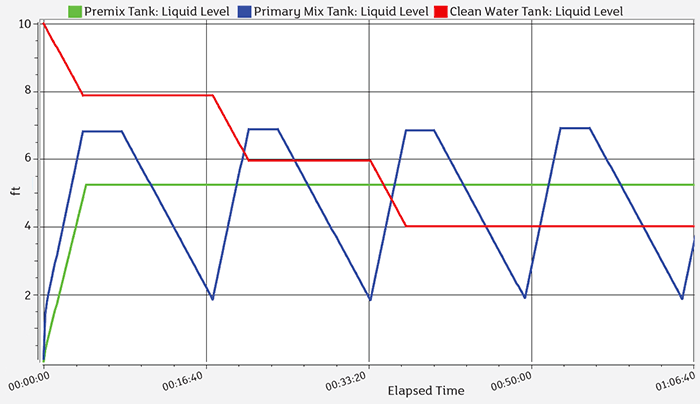 By opening and closing pipelines, turning equipment on and off, and setting the levels and pressures in tanks and vessels, the user can quickly see how the system will be operating at any moment in time. Using the dynamic simulation feature, users can include the logic for the system (equipment logic, instrument set point, control valve settings, etc. ), and then the program simulates how the system will operate over an extended period. Since many of these conditions are highly unusual events, it is unlikely that any one individual has sufficient background to determine what will happen under extreme operating conditions. This is where the ability to simulate those conditions can provide crucial insight. The plant operating procedures describe the steps that must be taken, date to be recorded, conditions to be maintained, samples to be collected and the safety and health precautions to be taken to successfully operate the process system. The operating procedures must be easy to understand, technically accurate and maintained to reflect the current operation of the system. The operating procedure should be reviewed by the engineering staff and operators to ensure accuracy. It should include sufficient detail on how the job duties are to be performed. Operating procedures should describe safe pressure limits, temperature ranges, flow rates and applicable alarms. Finally, procedures should clearly state what to do when an upset condition occurs. The PSM program requires all employees, including maintenance and contract employees involved with highly hazardous chemicals, to fully understand the safety and health hazards of the chemicals and processes.